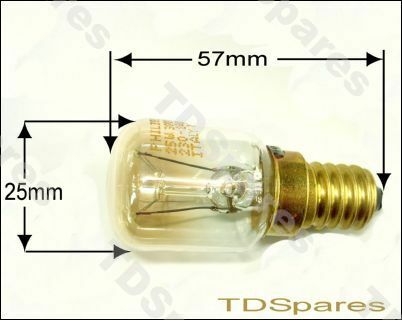 Oven Light Upgrade Kit, Includes 25w 300° Oven Bulb And Deeper Glass Lens Cover 33mm Diameter*, Replace A 15w Oven Lamp To Give A Much Brighter Light In Your Built In Or Range Cooker. Or just replace a broken unit. Is your oven looking a bit dull, can't see your food cooking? well this oven light upgrade kit might be the answer. Most manufacturers fit 15w light bulbs to their ovens, but this can be a bit dim! 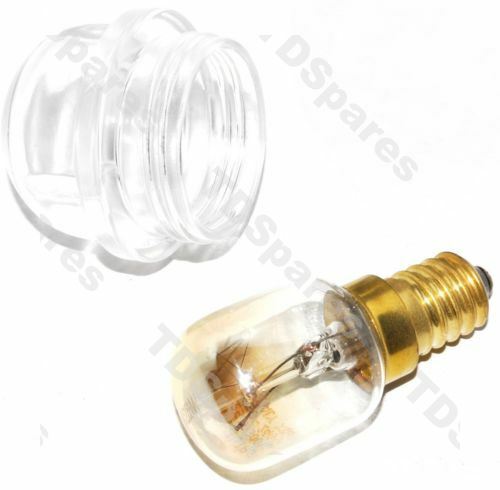 This E14 25w oven light bulb and glass lens cover will replace any standard 33mm (please check) threaded glass lens and 15w E14 oven bulb. Why not just change the bulb you might say? well, 15w oven bulbs are slightly smaller than 25w bulbs so your original glass cover will not fit over the new bulb, this is why the kit has both components which has a larger glass cover for a trouble free fitting. *Please note that this kit will only replace a 33mm thread diameter screw in (not bayonet) type glass lens, so please check your fitting before ordering! 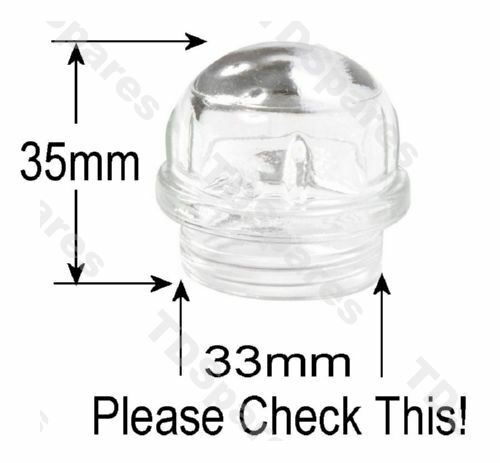 Will not replace 44mm or 60mm thread diameter glass lens- please see alternatives tab above. IBERNA FI010/3N, FI010/3W, FI010/3X, FI010N, FI010W, FI010X, FI0506X, FI0536N, FI0536W, FI0536X, FI110/3N, FI110/3W, FI110/3X, FI200W, FI200X, FI610X, IC32, IC36NF, IC36NFT, IC37, IC37 T, IC37ES, IC40, IC40CH, IC40ES, ICB360, ICM27, ICM31, ID24 CH, ID24 EUR., ID24 OS, ID24T EUR., ID28, ID28 T, ID28CH, ID31 NF, ID31NFT, ID33, ID40NF OS, ID41 ITA., IDP235, IDP280, IFL150IL, IFO0220 OS, IFO0310 OS, IFO0410 OS, IFO0510 OS, IMP245, IMP25.2, IMP30.0, IMP30.2, IOV12X, M2C37 ECO, M2C37T ECO, M2P31 ECO, M2P31T ECO, M2P40 OS ECO, M3C33 ECO, RI010/3GH, RI010GH, RI110/3GH, SCB32 ECO, SCB36 ECO, SCB36T ECO, SCB40 ECO, SCM27 ECO, SCO200 ECO, SCO201 ITA., SCO210S ECO, SCO300 ECO, SCO310S ECO, SCO390S ECO, SCO400 ECO, SCO500 ECO, SDP24 ECO, SDP24T ECO, SDP28 ECO, SDP28T ECO, SDP33 ECO, SMP25 ECO, STT13.2, 39002704, 39005467, 34654004, 34302406, 34388405, 34593004, 33074618, 337000988, 33700098, 33700113, 33700114, 33700115, 33700116, 33700142, 33700143, 33700148, 33700162, 33700288, 33700301, 33700318, 33700329, 33700330, 33700442, 33700506, 33700507, 33700508, 33700563, 33700905, 33700001, 33700002, 33700003, 33700007, 33700016, 33700017, 33700018, 33700019, 33700021, 33700022, 33700023, 33700095, 33700096, 33700097, 33700117, 33700118, 33700119, 33700155, 33700187, 33700188, 33700236, 33700237, 33700238, 33700241, 33700250, 33700251, 33700252, 33700269, 33700272, 33700273, 33700274, 33700276, 33700300, 33700302, 33700303, 33700304, 33700384, 33700399, 33700416, 33700438, 33700439, 33700440, 33700449, 33700454, 33700455, 33700459, 33700460, 33700470, 33700481, 33700495, 33700496, 33700497, 33700498, 33700499, 33700500, 33700501, 33700505, 33700509, 33700537, 33700541, 33700548, 33700565, 33700573, 33700630, 33700631, 33700632, 33700640, 33700641, 33700642, 33700646, 33700650, 33700651, 33700691, 33700692, 33700768, 33700780, 33700781, 33700782, 33700787, 33700789, 33700790, 33700791, 33700841, 33700844, 33700874, 33700877, 33700878, 33700894, 33700900, 33700921, 36222016, 36222115, 36222123, 36232007, 36232510, 36232528, 36289007, 36293009, 36293108, 36296101, 36299006, 33700020, 33700060, 33700153, 33700154, 33700156, 33700157, 33700234, 33700235, 33700239, 33700240, 33700242, 33700264, 33700265, 33700322, 33700394, 33700422, 33700423, 33700424, 33700451, 33700456, 33700458, 33700471, 33700472, 33700561, 33700574, 33700617, 33700619, 33700626, 33700637, 33700638, 33700639, 33700643, 33700678, 33700760, 33700890, 33700893, 33700896, 36105013, 36177020, 36177038, 36177129, 36233005, 36233013, 36274009, 36274017, 36274108, 36282002, 36282150, 36297000, 36297109, 33700061, 33700062, 33700063, 33700122, 33700124, 33700126, 33700232, 33700233, 33700256, 33700290, 33700396, 33700398, 33700400, 33700419, 33700420, 33700421, 33700615, 33700616, 33700815, 33700834, 36003010, 36003028, 36003101, 36003176, 36003515, 36274116, 34935163, 39006960, 34900024, 34900025, 34935015, 34935106, 34935114, 34935122, 34935130, 34993410, 34993501, 34517003, 34605014, 34451005, FR CCM 20/10, FD200, FR RC30 F GB, FRE KB22.10E, FRE KB28.12E, FR RC40 SUNI, COMBI 31 ARM, FO FP 835 CX, FOHMO635X, FOHMO635W, FOHMO635B, FOHMO837X, FOFL635W, FOFL635N, FOFL635X, FO2D766W, FS635AQUA, HMO635/1X, FS635ZEN, HMO635/1W, HMO635/1 B, FL636W, HMO635/1X, FOHMO635/1W, FOHMO635/1B, FS615ZEN, HOC706X, FO FP827 AL, FO FP 815 X, FO FP 827 X, FO FP825 X, FOF254/3XUK, FOF254/3WUK, FOF254/3NUK, FOF134/3XUK, FP 815 W UK, FP 815 N UK, FP 815 X UK, FOFP815WUK, FOFP815NUK, FOFP815XUK, FOHFO415X, FOHFO415B, FOHFO415W, FO 2D 365 X, FOFL503W, FOFL605X, FOFL134NUK, FOFL134WUK, FOFL134XUK, FO2D365XUK, FOHOP455X, FOHOS456X, FOHOS556X, FO FNP 827 X, FO FNP815XUK, FO FNP 615 X, FO FNP 815 X, FOFL605XUK, HOS316AXUK, HFO415/1X, HFO415/1W, HFO415/1B, FNP615NXUK, FL503W, FL 605 X, FOFL134XUK, FOFL134WUK, FOFL134NUK, FOFL605XUK, FOFNP615X, FNP615NXUK, FOFNP815X, FOFNP827X, FOFNP815XUK, FO2D365X, HOS 316AX UK, HOS 456X, HOS 556X, HFO 0415/1X, HFO415/1X, HFO415/1W, HFO415/1B, HOP 355X, HOP 455X, HOS316ABX, HOS316ABX, HMO837X, FFN607 X L, FIR715X, FFN 607 NX, FFN 807 XL, FFN 8071 XL, FPP 407 X, FPP 407 N, FPP 407 W, FPP 602 X, FPP 607 X, FPP 6071 X, HOC 706 N, HOC 704 X, FPP 406 X, HOP 2043 X, HOP 2043 B, HOP 2043 W, HOP 4063 X, HOP 4074 X, HOS 4064 X, HOS 4064 BX, FPP 407/1 W, FPP 629 XL, FPP 406/1 X, FPP 609 X, FPP 609 X L, FPP 407/1 X, FPP 407/1 N, HOC706NX, FO F 254/3 N, FO F254/3 X, FO F254/3 W, FO F234 X, FO F234 M, FO F234 N UK, FO F 2550 X, FO F134/3WUK, FO F134/3NUK, FO FP 827 X, FO FP 825 X, R43/3GHCR UK, FO FP602X UK, FO2D362X, FO 2D 364 N, FO2D364W, FO2D364X, FOFL132NUK, FOFL132XUK, FO2D362XUK, FO2D364XUK, FOFL132WUK, FO FNP 612 X, FO FNP 602 X, FCL614GH, FL501X, FL 132 W UK, FL 132 N UK, FL 132 X UK, FOFNP601X, FOFNP602XUK, FOFNP612X, R 43/3X, R 43/3GH, FS615AQ, FIR714GHX, FST 201 W, FHP 603 X, FFN 403 X, FPP 403 X, FPP 403 N, FPP 403 W, FPP 502 X, HOP 116 B, FCL 614/1 GH, FPP 403/1 N, FPP 403/1 X, FPP 403/1 W, FO FP 601 X, FO F233 W UK, FO F233/3WUK, FO F233/3NUK, FO F232 X, FO F232/3XUK, FO F132W UK, FO F132/3WUK, FO F132/3MUK, FO R 43/3 X, FO R43/3X UK, FO FL 501 X, FO FL 501 W, FO FL102N UK, FO FL102W UK, FO FL102X UK, FO IOV 12 X, FOFL 100/1N, FOFL100/1 X, FOFL102/1WUK, FOFL102/1NUK, FO R 80 GH, FL0100X, FL100/1X, FL0100X, FL100/1W, FL102/1NUK, FL102/1WUK, FL 102 X UK, FST 201 X, FST 201 N, HJA3212, FST 201/1 X, FO F112W UK, FO F112/3WUK, FO F112/3MUK, FO F112/3NUK, FO F112 M UK, FO F132/3NUK, FR CIL 170 A, RL 15CE, FR HBRU160AK, FR HBRU164AK, FR RBP 150, FR CRU 160, FR CRU 160 K, FR CRU 164 A, FR CRU164A K, FRE CRU 16.3, FR CRU16.0UK, FR ID 24, FR CFD 240, FREKNF040EOS. MIELE H310B/ H316-3B, H326-1B/ H326-3B/ H340BP/ H4210B/ H4210E/ H5061B/ H5081BP/ H5240B/ H5240..plus many others, please contact us. TIP- Use CTRL + F on your keypad to search for your model.